Clever Bulletin: Whose colorful extensions better: Britney Spears' or Christina Aguilera's? Whose colorful extensions better: Britney Spears' or Christina Aguilera's? Primetime just got a lot more colorful, thanks to two reality show standouts and longtime pop rivals: The Voice's Christina Aguilera and X Factor's Britney Spears. Both singers (and former Mickey Mouse Club costars) recently debuted bright, rainbow-colored hair extensions. Aguilera, 31, hit The Tonight Show With Jay Leno September 28 rocking neon pink and purple ends; last week, Spears, 30, mixed pink, purple, and turquoise pieces in with her honey-colored locks. For her new music video, "Your Body," Aguilera sported a variety of similarly edgy hairdos, which she created with the help of celeb hair pro Mark Townsend. "Christina is such an artist and she is very visual, so I love to collaborate with her and play with hairstyles," Townsend told Us Weekly about teaming up with the vocalist. "She is really into color in her hair . . . so we incorporated those trends into some of the styles." Britney Spears showed off rainbow locks at the iHeartRadio music festival in Las Vegas, embracing the street style trend of über-temporary hair color. Despite their newly matching locks -- and their equally impressive TV gigs -- Aguilera told reporters at a Voice press junket that there's absolutely no competition between the two former Mouseketeers. "The Voice" star Christina Aguilera appears in a colorful dress along with colorful hair at Spago restaurant with boyfriend in Beverly Hills Sept 28, 2012. "I came up with Britney . . . We were very close. Our paths have always crossed and they continue to cross," she shared at the conference, which took place just a couple of weeks before Spears' X Factor debut. "I welcome her to this family of fun and entertainment and finding new talent . . . I know she's a pro and she's going to give, I think, great advice." 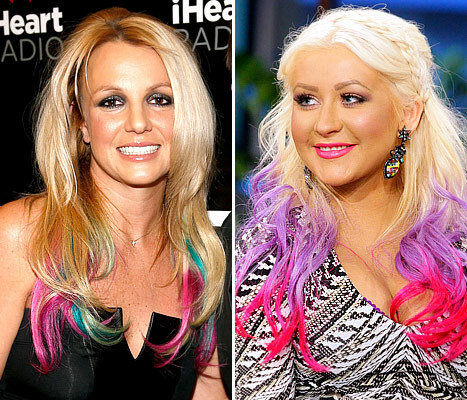 Tell Us: Whose colorful extensions do you like better: Britney Spears' or Christina Aguilera's?